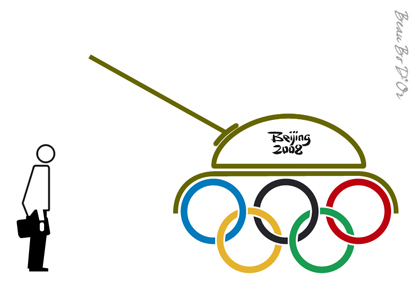 The torch has been lit for the XXIXth Modern Olympiad which opens in Beijing, China on 8/8/08. Its slogan “One World, One Dream” promotes a globalized neoliberal hegemony where individuals share a single vision. Shockingly blatant and fascist in its call for autocracy (as opposed to democracy, which would translate into a “Multiple Worlds, Multiple Dreams” slogan), this multinational sports spectacle recalls two prior games: the XIth Olympiad in Berlin 1936 which coincided with the Nazi regime’s rise to power and the XXth Olympiad in Munich 1972 marked by the desperate Palestinian struggle against Israeli occupation. 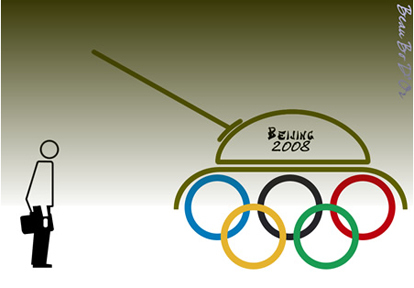 In 2008, these games again prefigure a new world order, one dominated by China. Massive unrest in Tibet and the government’s violent military crackdown this month reveal just how repressive and authoritarian the Chinese reality still is (despite the pr frenzy over its art fairs, cultural hotspots, open doors, and new markets). While no one wants—or perhaps can afford—to boycott the games, French president Nicolas Sarkozy has already threatened to skip out. With so many eyes (and recording devices) on China, here’s hoping the Olympic Games do prefigure a new world order, one that includes—not just dreams of—a free Tibet.